Nothing beats the feeling of a good massage after a long day’s work. It’s the same reason why entrepreneurs Ron Ferber and Alon Kaufman arrived to the idea of creating technological innovations that provide home and body relaxation. In 1987, they established HoMedics, a trusted brand of massage technologies and in-home wellness products. Some of the products they offer are massage chairs, handheld massagers, sports recovery massagers, and almost all kinds of massagers for the different parts of the body. One of their bestsellers is the foot massager. They have different types of foot relaxation technologies, depending on your need and preference. Some soothe your aching feet by putting pressure on your pain points while others utilize vibration to reduce tension off your feet. 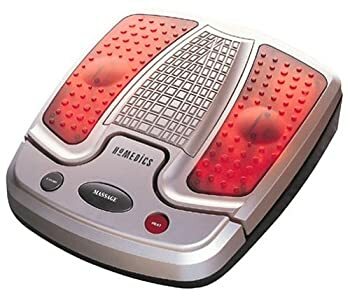 Take a look at these HoMedics foot massager reviews below! Read more: Reviews of the Best Foot Massager, Plus Astounding Benefits! Intense activities like running, jumping, and standing for long periods of time may cause foot pain. When you feel like rest is not enough to lessen the discomfort of your feet, a deep tissue massage using a triple action shiatsu foot massager can help. Customers love that it’s easy to operate using the toe-touch control, and the rollers effectively work without being painful. It feels like you’re in a spa having a relaxing foot massage. Someone even claimed that it’s fantastic on her plantar fasciitis or pain in the heel and arch. She said that whenever she uses it before bedtime, she doesn’t feel so much pain in her feet the next morning. 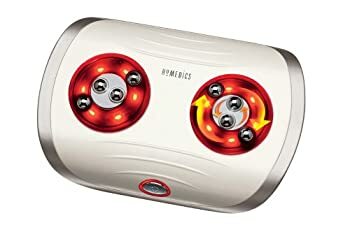 Based on the HoMedics shiatsu foot massager reviews of the users, it’s no wonder why this triple-action foot massager is considered as one of the best foot massagers from HoMedics. It’s large enough to accommodate any feet size. It massages deep enough to lessen pain and tension. The triple-rotational balls provide a relaxing experience. If you want a more soothing massage, pressing the heat option can help. It just lay flat and not angled upward. If you want to sit while having a foot massage with it, you still need to place a book or cloth underneath. There are parts of the feet that it can’t massage. You still need to move your feet so that it hits the pain points. If your feet feel tired, relax a bit and pamper yourself with an Air Pro Shiatsu Foot Massager. It is built with different settings for an ultimate foot massage experience. Customers like that it features both rollers and air compression. It massages every part of your feet, even your tiny toes. Moreover, you can choose from low, medium, or high-intensity massage options. However, some recommended that the product be improved to last longer because as of now, it automatically shuts down after 15 minutes to avoid overheating. Customers also shared that they still have to wait another 30 minute for it to cool down before they can use it again. It comes with an Air Compression system that gently squeezes feet. You can choose if you want a low, medium or high-intensity massage. Special controls allow you to choose if you want air compression, kneading, or both. Pressure is not strong enough for some people who are used to deep massage. It reaches every part of your feet except the back of the heels. Wearing ill-fitting shoes as well as those with heels can cause pain in your feet. What a relief to take those uncomfortable shoes off! Soft and furry slippers are certainly way more comfortable to wear. What more if it also works as a foot massager? This remarkable air compression foot massager from HoMedics is known for its powerful massage that reaches the soles and arcs of the feet. You can also feel a soothing heat for added relaxation effect. Based on some foot massager reviews, people who bought this product commend its customizable settings. They like that they can choose the intensity of the massage and if they want to feel soothing heat during the process. However, they suggested that this product be open-toed so even big feet can fit. When feet are correctly placed, this foot massager can give a better massage than other shiatsu massagers because of the air compression variable. If you’re feeling cold, you can turn on the heat function to soothe your feet. The hard squeeze could be painful to your feet. Since your feet couldn’t go in further, the foot massager couldn’t massage your heels. It’s not for people whose feet are larger than women’s size 9. This electric foot massager is angled so that you can lean back while taking a soothing massage. It comes with a vibrating platform with bumps of varying size based on the practice of reflexology. 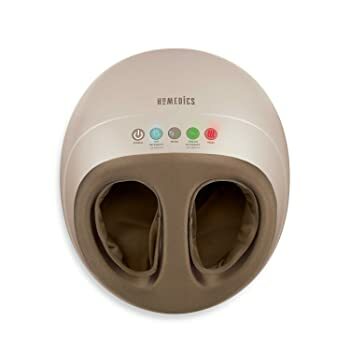 This HoMedics foot spa appealed to customers whose feet feel numb. They said that the product’s vibrating motion activates their feet’s blood circulation. This product has four reflex rollers that massage your feet thoroughly. It has a vibrating platform with two massage intensities that you can choose from. The vibration may not be strong enough for some, so you have to use it longer to get a positive effect. It automatically turns off after 45 minutes. This lightweight foot massager soothes your feet using a counter-rotational massage action. It lessens tension and leaves your feet soft and relaxed. Some customers who have inflammatory conditions love this product because it helps reduce the pain they feel. One even said that the rotation and heat features work wonders; they help him have a good sleep. The product is also durable and lasts longer than other foot massagers. That’s why some consider it a bang for the bucks and the best foot massager for the money. 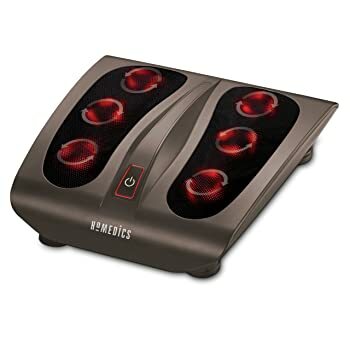 The rotating features press, rub, and massage your feet and eases the pain you feel in your feet. Since it is handy, lightweight, and has a long cord. It’s also easy to transfer from one place to another. Like most foot massagers, this product has a narrow base. So, if you want to open your legs wider to relax while having a foot massage, you can’t. This product is only capable of light massage, so it’s not the best choice for those who want a hard massage. HoMedics is changing the way people experience relaxation by bringing world-class massage products at home. Now you don’t have to see your massage therapists right away because you have HoMedics products within your reach. 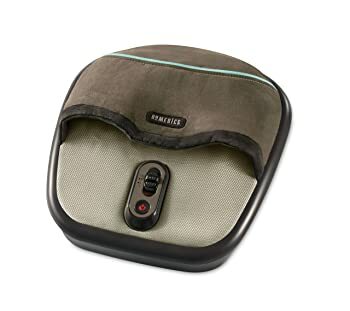 Among all the foot pampering machines included in our HoMedics foot massager reviews, the HoMedics Air Pro Shiatsu Foot Massager with Heat stands out because it can encapsulate your feet and massage every part. Unlike the other foot massagers, this foot massager combined rollers, air compression, and heat to soothe your tired, aching feet. We also love to hear what you think. Let us know by leaving a comment down below. Thank you!